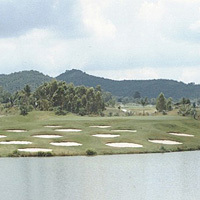 About 45 minutes from Pattaya, Desmond Muirhead has created Thailand's most interesting golf course. It's two Par 6's are maybe a bit much for the golf course purist, but there's certainly some spectacular holes and views and it's a pleasure to play if you're mid to low handicapper. The course conditions are good, without being fantastic, and the neigboring Green Valley Rayong Country Club makes it popular with the golf tourist. Extremely tough test of golf from any tee and definitely one of Thailand's and Asia's most interesting and exciting layouts. Bring lots of golf balls. I repeat, bring lots of golf balls. Bring a camera and expect to be beaten up by this course.